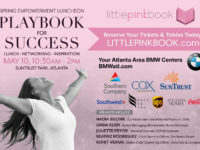 ATLANTA (July 22, 2015) – Little PINK Book, America’s #1 digital platform for the nation’s 70 million working women, today announced that Tami Barron, CEO, SouthernLINC Wireless; Bill Burke, COO, Newell Rubbermaid; Ann-Marie Campbell, President SE, The Home Depot; Linda Galipeau, CEO, Randstad North America and Alison Lewis, CMO, Johnson & Johnson Consumer Family of Companies will offer guidance and lead a discussion on how to move more women into leadership roles during PINK’s 11th Annual Fall Empowerment lunch scheduled for October 19th from 10:30am-2pm at the InterContinental Buckhead Atlanta hotel. Panelists will tell their stories about earning the top job while enjoying the journey, and also the personal price they paid for success. More panelists will be added in the coming weeks. Click for details. Of special note, PINK will more directly include men in this year’s dialogue by adding a top male leader to the distinguished panel. Newell Rubbermaid COO, Bill Burke, has long been an advocate for women’s advancement and will join this year’s conversation to articulate his rationale and best practices. The sponsors that make this event possible include InterContinental Hotels Group, The Home Depot, Intimacy, Southwest Airlines, Everywhere Agency, Atlanta Homes & Lifestyles, Valeo and Atlanta Trend. PINK will contribute 100% of raffle proceeds to The Dress Project, a nonprofit that supports education for African women and girls.